Pankaj Kumar or Pankaj Bector. Jitten shah is good name for him are U Muslim ? ok i got here being a skeptic, one with a great curiosity and somewhat openness to see what i find. i am in the middle of some soul searching, significance for a better future. but is the kind of " i'll know when i find it" type of search. always searching and wanting to know more in undefined terms. after filling the expression/destiny number calculator and reading the description based on those numbers (7) ,now, i am intrigued. still some skepticism, it might be a coincidence but, those words are a full description and the things to be wary of, well, are happening. thank you guys for this experience, you have a gift that may turn skeptics into believers, but i still want to know more. Hi. I would like to ask something about destiny number. Is this the chart that we use for any name, in any language? Regarding to those names that include others letters-symbols like in the chart. Like in French language for example or Romanian, or Polish. The alphabet of those countries contains more letters. Has the name to be transcripted? Hi Elena, the Pythagorean system we use here was designed with western languages in mind, using the Roman alphabet, and catering more to English as the primary language. If we encounter any special characters such as those with accents we convert to their basic letter equivalent. For example any form of à, á, ã, ä, etc ... we treat as a standard "a". 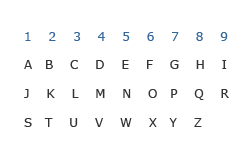 For languages where the entire alphabet is completely different, you can transcribe all their letters such as can be done for the Greek alphabet at the following page - https://seventhlifepath.com/greek-alphabet-in-numerology/, but it is generally recommended that in such a case you should really use the numerology system that is specific to your language and region from which your alphabet originated from. What does it mean to have master 22 life path and destiny with a daughter as a rainbow child born 1010/16 with 11 life path and father 33 life path? My destiny number is 11. The description states never to round down a master number. But in the reading you provide the 11 is rounded down to a 2. And then the information is all about the 2. No mention of destiny 11. Huh?? Which name to write there? Because I have two names , one is my birth name and second is my official name. I usually write my official name i all my official documents and people too know me by my official name. Is it necessary to mention father's name? In Pythagorean numerology we use your full birth name. Please find the destiny number for Mr. Prashanth 4/12/2007 , Requesting you to do the needful as it is very urgent..! I've seen somewere that K - is 11 and V is - 22 What do you think about it? Hello Spiritual Darlings of Light, I'm having trouble defining my destiny number, can you please help? Hi and thank you. I calculated my destiny number and it was not the same as yours. Hi Hallie, I am thinking you might have to double check the way you did it ... unless I am wrong here? ...why did you start the Numerology Number Definition of 3 with the negatives? ..my soul urge # adds up to a 22 .. why does this calculator reduce 22 to a 4? I thought master numbers stay master numbers..
my biggest question ..a bit sad to say as an adult..my parents got divorced when i was young..during this period of chaos, they changed my name 3 times on my birth certificate..so I'm getting 3 different outcomes...if a name is your destiny..do i have 3? 2) calculator does not reduce 22. If i have your full name I could give you a proper breakdown. 3) That's a tough one. I'd go with the last name you got, which should be the name you are currently using ... unless you associate yourself better with your other names. Really it is up to you to decide which names resonates better overall with you.